Used chip ESP8266 is a highly integrated chip designed for the needs of the new interconnection with the world. Offers a complete and comprehensive Wi-Fi network solution, which allows you to either host the application or use of all network functions from the other wireless implementation. In the used chip ESP8266 is an integrated microcontroller, which you can / don't use. If you do use it, you don't ever need the arduino to connect. This board has 2 IO ports and UART (RXD TXD). The challenge is here! Connect to this board a digital thermometer/hygrometer, set the WIFI as the DHCP client and display the temperature on my phone, on the computer or anywhere on the internet! Wireless WIFI thermometer can be manufactured, under 200 Czk. The Internet of things is coming! The module contains a program for communication through serial link using simple AT commands. This module requires a power supply of 3.3 V for VCC and 3.3 V logic. Is not 5V tolerant. 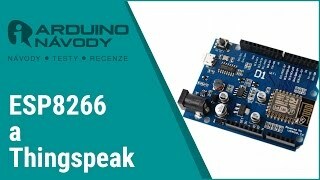 By connecting the RX or TX on 5V Arduino with this module will be destroyed. You need to use a converter of logic levels, or the Arduino at 3.3 V.
This is a performance version of the WIFI with good throughput environment. At peak times it can be the power consumption relatively high. Needs at least 300mA. 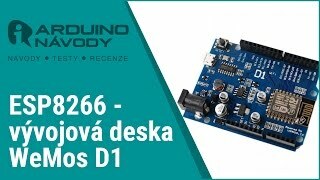 Power supply 3.3 V on the Arduino Uno is not sufficient for the power supply of this module. You need to ensure a separate. Create something for the internet of things!